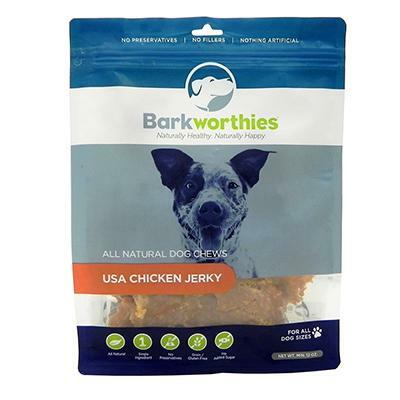 Barkworthies USA Chicken Jerky Dog Treats 12oz. Just what you've been looking for: Chicken Jerky for dogs, that is 100% sourced and made in the USA. Barkworthies USA Chicken Jerky is thick cut with nothing added. Delicious natural flavors make Barkworthies USA Chicken Jerky the perfect low-fat, high-protein snack for your best friend. 12oz. Size comes in a resealable plastic bag.